Due to the fact that damselflies inhabit the slow-moving or still water areas of rivers, most fly fisherman, especially those who practice upstream nymphing in fast flowing water, pay scant regard to their prevalence and their importance in the diet of trout. Inspection of aquatic vegetation and submerged tree detritus, found mainly on the edges of the slow moving sections of rivers and streams, as well as stomach pumping exercises performed on trout, however, confirm the status of damselflies as an important food source for trout in rivers and streams. This article presents a short overview of the damselfly life cycle, the damselfly nymph anatomy, the most important families of damselflies found in South Africa, and a description of the materials required and tying procedure for an impressionistic, South Africa-specific, damselfly nymph imitation. Damselflies (Zygoptera) and true dragonflies (Anisoptera) comprise the suborders of the order Odonata. The Latin name for the damselfly is broken up into zygo, which means “yoked”, and ptera, which means “wings”. The “yoked wings”-description refers to a unique physical characteristic – the wings of the damselfly are more yoked than any of the other aquatic invertebrates trout feed on. The life cycle of the damselfly is incomplete and consists of three phases of development, namely: the egg stage, nymph stage and the adult stage (the newly emerged adult is known as a teneral). The damselfly nymph has a life span of one to two years depending on the specific species, and, as mentioned above, occupies the aquatic vegetation found in the slow or still water areas on the edges of rivers. The nymphs swim amongst the aquatic vegetation by moving their abdomens in a side-to-side or wiggling fashion, or simply walk around amongst the aquatic vegetation. Damselfly nymphs are efficient predators that actively feed on smaller aquatic invertebrates – to this end their lower lips (also referred to as masks) are modified, which allows them to fold open to catch prey. Closer inspection of the damselfly nymph shows that the lower lip lies tucked back under its head. Prior to emergence the damselfly nymph swims or crawls to aquatic vegetation or other in situ structures, which break the water’s surface, and crawls up to the surface, where it emerges into the adult. 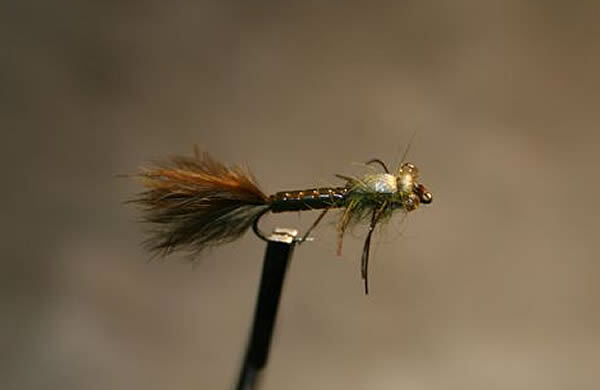 Trout readily target the nymph during this period of migration – due to the fact that these nymphs are relatively large when compared to mayfly, caddisfly and stonefly nymphs, large trout will commonly feed when they are emerging. Damselfly nymphs may on occasion loose their grip or footing and as a result get washed downstream, especially during floods – this occurrence is known as “catastrophic drift”. The common physical characteristics that define the anatomy of all damselfly nymphs include: two to three tracheary gills (erroneously referred to by some as tails) situated at the end of the abdomen; an abdomen long and slender in appearance; a very short thorax (broader than the abdomen); dorsal wing cases overlapping the upper thorax and abdomen; three sets of long, spider-like legs situated along the thorax; and a short head, wider than the thorax, on which a large pair of compound eyes are located. All the South African families have visible antennae situated on the front part of the head. Dragonfly nymphs are easily confused with damselfly nymphs. It is, however, fairly easy to distinguish between the dragonfly nymph and the damselfly nymph – dragonfly nymphs are generally stockier in appearance compared to damselfly nymphs (damselfly nymphs have thin, cylindrical bodies), and the dragonfly nymphs do not have tracheal gills situated at the back of their abdomens, whereas the damselfly nymphs do. There are seven families of damselfly found in South Africa rivers and streams namely, Calopterygidae, Chlorocyphidae, Chlorolestidae, Coenagrionidae, Lestidae, Platycnemidae, and Protonearidae. Of the aforementioned families, the Coenagrionidae family is found most often, during seine netting exercises performed in the rivers and streams of the North Eastern Cape, as well as the stomach contents of trout, subjected to stomach pumping, that inhabit these rivers and streams. This family exhibits a body colour ranging from pale green to pale brown. Although there are seven different families of damselfly that occupy South African rivers and streams, one only requires a single, generic imitation in either green or brown. The creation of an artificial facsimile of every single family, whilst at the fly tying bench, translates into superfluous time wasting – time better spent fishing than fly tying. Hook: # 12-8, 2 X long nymph hook. Weight: 6-12 turns of 0.015 mm lead wire, depending on flow and depth. Wing case: thin-skin, scud back or in this case 1mm olive or brown foam, pulled tight. All the same except for abdomen that consist of green, olive or tan nymph rib. The imitation should be fished in slow water conditions with a slow hand-twist retrieve or dead drift in faster water conditions.